From time to time I like to round up the latest news and filter it through my understanding of our spiritual nature and the noble-savage dispositions that we humans carried along with us into this Second Epoch… from Atlantis. I post those news roundups on my other website, and I then post a summary here on macyafterlife. I’ve broken the current news roundup into three parts relating to how fragmented (disparate), fractured (broken), and fractious (unruly) the world seems to be today. And here, below, is a summary of that installment. We humans like to take a romantic view of our many cultural, racial and religious differences, even though differences lead to incompatibilities, and incompatibilities lead to misunderstandings, mistrust, and conflict. If we can’t eliminate the differences that divide us, we should at least make an effort to keep them compatible… harmonious… resonant. 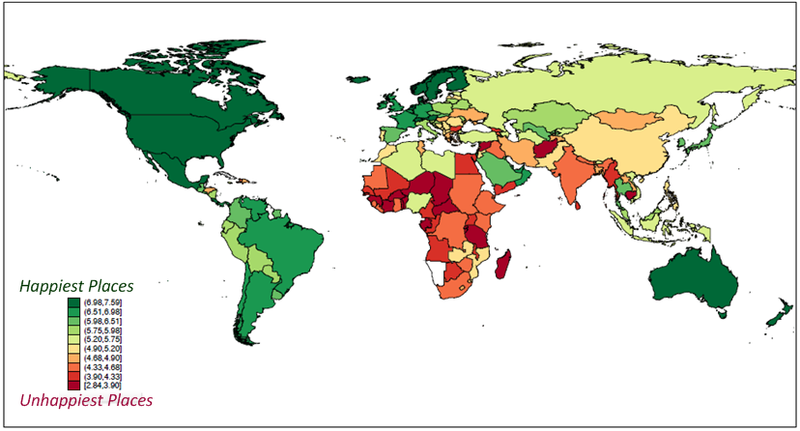 This map from the 2015 World Happiness Report shows how contented we humans are across the world. trust (as measured by a perceived absence of corruption in government and business). It would be in the best interest of posterity if we, today, could enact solutions to raise every nation to a state of happiness. Today there’s one gadget in the global toolbox that’s been specially designed for that purpose: The Vitality Ratio… a running correlation between a country’s resources and needs. It’s my belief that if a society’s material and energy needs can be kept in line with its resources (through population control and other means)… if there are enough resources to go around and not too many mouths to feed… then and only under those conditions is it possible to have true and lasting contentment here on Earth. The other factors of happiness will always be out of reach if a society’s needs exceed its resources. Social support, freedom, equality, generosity, and tolerance can be achieved and maintained only after everyone’s basic needs have been satisfied. It’s when needs begin to exceed resource availability… when there are too many mouths to feed… when competition for dwindling resources becomes brutal… it’s then that the savage side of human nature rears its head and eventually goes berserk, spinning off into genocide and war… and contentment slips way out of reach. One main purpose of the Vitality Ratio is to preserve human contentment by preventing scarcities that lead to brutality. Among the ancient ruins of the world are the ziggurats, which, back in the day, looked like massive temples / cathedrals / pyramids / skyscrapers. Some ziggurats were taller and bulkier and more elaborate than even the Great Pyramid at Giza. 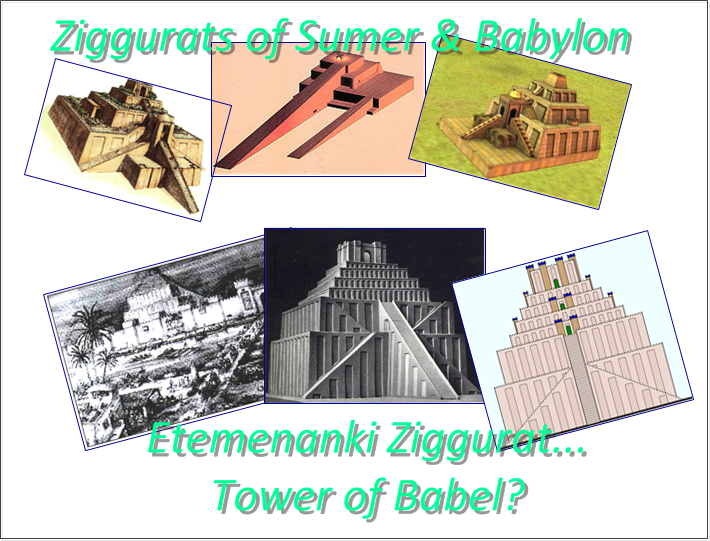 Modern scholars can only speculate about the exact purpose of the ziggurats, but many think that the largest one, built in Babylon and named E-temen-an-ki (meaning “house of the foundation of heaven on earth”), may have been the legendary Tower of Babel. The Etemenanki ziggurat was associated with the Temple of Marduk, the Babylonian god that shared a name with the late, great planet Marduk, or Eden, where our earliest human ancestors came from (… despite what you read in all the history and anthropology books…). The Tower of Babel, as described in the Bible, was built in Babylon after the flood (which would mean after the fall of Atlantis, at the start of the Second Epoch), and its purpose apparently was to provide a single bridge or connection point between the carnal world on Earth and the worlds of spirit. The ancient texts suggest that the intent with Babel was to have everyone on Earth speaking a common language… but something went wrong. Apparently, misguided titans (whose assigned task it was to bring order to our world, not chaos) mishandled the original intent of one unifying world language… and instead fragmented human cultures into many different languages spread around the world… all stemming from the Tower of Babel. The Tower, then, laid a groundwork of misunderstanding and mistrust within humanity that has lasted to present times. Today there are some 7,000 different languages spoken on Earth. In recent centuries there have been efforts to gather humanity back together under an umbrella of a single global language… or at least to provide an international auxiliary language… such as Volapük and Esperanto. But suddenly, in the last century, the world was transformed by the high-tech, Internet age, and the English language happened to be at the right place at the right time. English today is spoken by some 2 billion people, making it the closest thing we’ve ever had to a planetary language. That’s a lucky come-about for native English-speakers like me, but a misfortune for the rest of the world, when you consider the many absurdities of the English language. Bough – cough – dough – hiccough – thorough – through – tough – trough… really? With any luck, a good, simple world language will arise over the next century as globalization continues. Religions down through the ages divide naturally into various sects and denominations that appeal to different types of people with different dispositions. The more orthodox and conservative religious sects prescribe clear-cut morality and insist that their belief system is the truth. (Read more… ) There are certain types of people who feel stable and secure as part of a tenacious, final-word social group. They are typically organized, conscientious, dutiful, high-achieving, dependable, and strategical. They don’t like being faced with a lot of new information that can dilute or undermine those good, stable qualities. Those people often feel at home as part of an orthodox / conservative religion. The more liberal and contemporary religions advocate tolerance for other beliefs and personal responsibility in making moral choices, while downplaying the need for autocratic worldviews and moral codes. (Read more… ) Certain types of people are more comfortable when they can process new information and reconcile it with their own worldview, while giving strangers the benefit of the doubt. They are open to new experiences, curious, creative, and prefer novelty and variety. Those people often resonate with liberal religions. These are the same contrasting personality traits that divide us humans politically into liberal and conservative camps. They’re two of the “Big Five” personality traits that have become a cornerstone of modern psychology over the past 30 years. The next installment of this news roundup will look at ways of healing a fractured (broken) world, and I’ll probably post it within the next week. I’m pleased to say I have more time lately to work on these two sites (macyafterlife and noblesavageworld), since I retired from my technical writing contract work a few weeks ago. This entry was posted in Uncategorized and tagged conservative and liberal religions, world happiness report, ziggurats. Bookmark the permalink. Mark’s books are great. I have read all of them and I recommend them. I have all four of his books and they have genuinely provided the foundation of a renewed understanding of our complex reality. They are all incredibly-beneficial to anyone who reads them. I discovered his first book – Conversations Beyond the Light – in the summer of 2012 (three years ago) and my understanding of our spiritual model has never been the same. I have gained a very deep level of wisdom from reading about the incredible events that occurred in Europe and here in the US in the 1990’s with INIT – a large group of Scientists/Doctors – and their interactions with those on the “other side”. 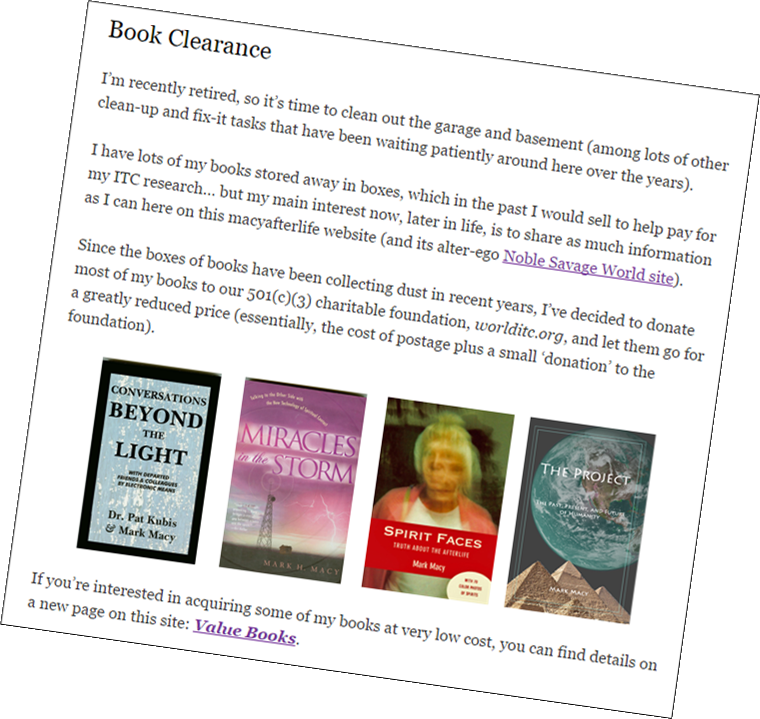 The books speak for themselves – I couldn’t recommend them more highly! You guys make the journey a lot easier and much more pleasant! Hi Mark, I have also been clearing out my library …. and adding new books that I just cannot resist. Your low-price offer is too good to resist, for knowing how much I enjoy your posts, I am sure to enjoy your books as well. I’d like a copy of each. Problem is that I do not have a cheque account. I usually use Paypal, but if that is not possible, would perhaps a money order suffice? Thanks much. A money order is fine. Unfortunately I’m unable to get credit cards or PayPal working on this site at the moment, which would require me upgrading to a more cumbersome version of the webhost software. I like the simplicity of the site as it is now, so I’m probably not going to upgrade in the foreseeable future. It took some thought… but in a few days I figured out how I could set up donations with PayPal on my existing site.. If you already went to the trouble of getting and mailing a money order, I apologize for the inconvenience.